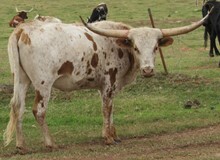 Big horned tall cow. Good mom, calm in field. Not aggressive. Becomes anxious in smaller pens - especially when alone. 90" TTT potential at maturity! Lots of total horn in that twist! 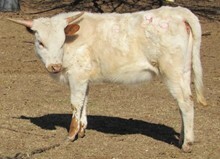 Over 80" ttt herself, she is exposed to our 107"+ total horn 6XChampion bull Hustler 969.